Latham has not lost much of his arrogance. He begins this Quarterly Essay with a self-congratulatory introduction for already raising the organisational dysfunctionality of the ALP in The Latham Diaries and he ends it by patting himself on the back for having written a "quite productive" essay.Personality aside however, he may be right. 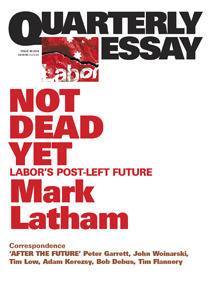 Latham takes great care to provide an essay with real suggestions for change, rather than the endless introspection and fighting found in the usual commentary and books such as Lindsay Tanner's Sideshow.In short, his answers involve embracing the pre-selection/primary style nomination process being tried out by the ALP right in NSW, scuttling union influence; owning the Keating reforms of the 90s, educating the now "post-left electorate" about the fallacy behind the perennial cost of living debates; a real education revolution based on teacher standards, performance pay and encouraging more home/parental involvement; a war on poverty based around a policy of dispersal - moving public housing into the general community; taking advantage of the public's nervousness at the increased far-right fanaticism ala Bolt, Jones and Abbott; owning the issue of climate change, differentiating the ALP from the climate-sceptics on the far-right.All interesting ideas and worthy of debate, so the essay is certainly worth reading. Whether any of it is practical or feasible given the current state of the ALP? That is another question. Since deregulation, the federal government has little control over inflation and the cost of living. Yet in recent times, political parties have used cost if living as a key issue to win votes. With the weakening of the Labor party in recent years, Mark Latham argues that for Labor to be a strong political party again, it must reassess the dominance of unions and try to present a more realistic image of how the government of the day can influence economic factors, if at all. Research show that on average, including low income earners, the actual amount of disposal income has risen over the years. So why is lowering the cost of living such an important issue?Latham also uses this essay to discuss what he sees are the issues within the Labor party and (unlike many current commentaries) offers suggestions as to how these issues may be addressed to once again be a political party of change and for the people. My review cross-posted from On Line OpinionThe last weeks will have shown any remaining optimists that the Federal Parliamentary Labor Party - the flagship of the labour movement - is all at sea. It's suddenly obvious even to the dullest pundit that there's no iron historical law stating that the ALP has to be a viable party of government, nor even one that says it must continue to exist. Its current national primary vote is at 30%, which is down there with the lowest ever polled, and below even the most pessimistic previous estimates of the floor on Labor's support. The Coalition meanwhile are rampant, with half the electorate saying they'll give them their first preference. Last week's ministerial resignations showed how riven Caucus has been by leadership issues, and the continued control of the factions and unions seems incompatible with a continued capacity to field a leader who might win. There has been much published Labor self-analysis since the electoral wipeout of the last Labor government in New South Wales, a reminder of whose improbity is available in daily updates from the current ICAC hearings. There will be bookshelves worth of introspection and well-meaning advice after the drubbing which is now certain to happen on 14th September. If nothing else the new essay on Labor's troubles by Mark Latham is well timed.Those who read Latham's Diaries will remember their blending of acuity and delusion. In the introduction, Latham's account of the sicknesses of modern Labor and the political-media complex was detailed and spellbinding. But the diaries proper had enough bombast, rancour and self-deception to confirm that Australians had been fortunate and wise in 2004 when he lost the election. The book showed Latham's combative intelligence, his personal immaturity and their shared source in his ressentiment. That quality was expressed in the boofheaded moments for which many will remember him longest - the crushing handshake with John Howard in the annex at Ultimo in 2004; 2010's mid-campaign monstering of Julia Gillard at the Ekka, talking over her and looking down on her at close quarters, hemmed in by the boom mikes of the travelling media. That he's able now and again to entertain us with iconoclastic columns and Hendo-baiting amplifies rather than dispels our sense that his interior world is structured by grudges and antagonisms.His new Quarterly Essay, Not Dead Yet: Labor's Post-Left Future like the Diaries puts truth side-by-side with fantasy. His criticisms of Labor's broken factional system and of the far right's media tactics are mostly well-made. His proposals to fix it all are not only, as Matthew Cowgill points out, somewhat out of time. They are riven by a startling series of contradictions. They reveal a more-than-latent authoritarianism directed at the most disadvantaged members of the community. But they are unintentionally useful in gauging the depth of Labor's problems.His version of those problems will be recognisable in outline to those who are familiar with the genre of ALP self-flagellation - ranging from books by Rodney Cavalier to the party's own internal reviews and reports. But as someone who raised these problems early and publicly, he has earned the right to revisit them. His portrayal is of nothing less than a death spiral. The leaders of an industrially unrepresentative union movement exercise outsized control on party forums and even parliaments by means of nested factions and subfactions, where "the innermost layer of Labor's Russian doll is a cadre of trade union officials – party bosses with the power to endorse and disendorse ALP members of parliament" Thus networks of patronage and reward have displaced even vestigial forms of internal democracy. There aren't many incentives for joining or remaining in the ALP; there are even fewer for labour movement capos to fix things. Indeed, the withering of the grassroots only consolidates their power. The desertion of the membership means a reduced connection with the people, which means that policy cannot organically emerge from electoral concerns. Labor is no longer a community-based organisation, nor will it ever be again. The Party of the common man now finds it difficult to connect with voters. The bizarre spectacle of Julia Gillard going on a listening tour of Rooty Hill is easier to understand if we accept that his account is mostly true.Latham is relaxed about this. He has no expectation that mass membership will return; economic and social life have changed too much. He thinks that Labor's ranks will now mostly be composed of those building a political career. But he thinks a top-heavy party can be counterbalanced and build community bonds with primary elections for candidates. He happily attributes this idea to others, but he has detailed and - who knows - probably workable plans for their conduct. Even desultory moves towards public participation in candidate selection should probably be welcomed by progressives, just as they ought to welcome any small expansion of democracy within Labor. And Latham's right that there's no indication that mass parties will ever return - in the terms of political theorist Bernard Manin, we have left the age of "party democracy" and entered the quasi-populist era of "audience democracy", where the political process is more than ever mediated, and parties have been displaced by consultants and charismatic leaders. Primaries are a recognition of the exigencies of this new era. But of course bringing off these ideas wouldn't bring us a inclusive process of policy development, and the intellectual framework in one in which minimal, economic, aggregative theories of democracy are taken for granted. As authors like Colin Hay and Colin Crouch point out, the extent to which politicians have accepted this self-defeating conception of politics is the extent to which the public has become alienated from them, and itself adopted a calculating view of liberal-democratic processes.The first big contradiction opens up when Latham pushes all of this further, arguing that Labor's problems also arise from its unwillingness to carry forward the Hawke-Keating policy legacy. He believes that in not doing this, Labor is missing a chance to appeal to the "aspirational class" (more of which anon). After talking about the haemorrhaging membership, he relates a conversation with Keating:"When Keating retired from parliament, having set up Australia's miracle economy, he was sceptical about the durability of free-market economics inside the party. "I got all those changes through," he told me in his retirement years, "but our people never really believed it, they never really believed in markets and competition. "He never puts this accurate view of members' values together with the fact of their departure. To do this would be to recognise that part of the reason that people have left (or younger people never joined) is that they see Labor as having abandoned its fundamental principles. It would also be to admit that in fact, from MySchool to the QR privatisation, Labor state and federal governments have mostly persisted with the orthodoxy that arises from neoclassical economics and related bodies of thought like public choice theory. It's not just members who are appalled by this. Fresh Essential survey data reveals voters - Labor loyalists and otherwise - also feel that Labor has lost its essence. The lost tribe of progressive Laborites who now vote Green are part of a vanished coalition that Keating, in effect, helped to destroy. Another group have gone over to the Tories because, seeing few remaining ideological differences, they have followed the ineradicable electoral intuition that says that conservative governments are more competent. Following the assassination of Rudd, when Labor can again put together a majority coalition is an open question.Latham never admits that the Keating program - along with Keating himself - had and continue to have very little electoral appeal. His deregulations, privatisations, public sector interventions and all their consequences were unpopular, and fed directly into Pauline Hanson's reactionary-populist revolt. The incorporation of her ideas into Howardism reframed Australian political debate in a way that permanently advantages the right. Meanwhile, survey data perennially shows that voters think that they've lost out from privatisation, would like the government to have more of a role in the economy, and that it would be preferable if government ran most public services. Last year's election in Queensland and the subsequent fate of Campbell Newman show that privatisation is still unpopular enough in itself to destroy governments and leaders.Rather than confront any of this, Latham would prefer to keep company with those who would like to continue to try to excise as much as possible from the scope of public debate. He is frustrated that attempts to depolicitise economic matters by, for example, corporatising utilities, have not worked. He refers to former Queensland minister Rachel Nolan's letter in response to Laura Tingle's Quarterly Essay, Great Expectations. Among other things, Nolan complained, as a Labor minister, about having to adjudicate on workplace issues - that is, she objected to having to make political decisions. She was responding to Tingle's apologia for the political class in the face of recurring public demands that governments do more, where she urged an acceptance of the status quo of diminished public control and restricted political debate. The problem with such attempts to exclude the political, as political theorist Chantal Mouffe reminds us, is that it tends to return in ways that are difficult to predict or control, or are directed at the system as a whole. That's obvious from the fact that people still blame governments for their inability to make ends meet, even as governments try to divest themselves of the relevant responsibilities.The supposed appeal of all of the Keating agenda to the suburban "aspirational class", though, grounds what must be Latham's oddest and most enduring political daydream. The aspirationals are those who, according to Latham, had their material and lifestyle ambitions permanently awakened by Keatingism. In Latham's suburban pastoral, they care a noble, postmodern yeomanry - entrepreneurial, ambitious for their children, upwardly mobile, "empirical". They are the platform for Labor's future electoral success, but for now Labor's abandonment of Keating's legacy has meant abandoning them as a constituency. In the imagination, they live in Sydney's west, but with faces are turned East towards their future, closer to the harbour. Latham's big idea is that the increasingly obvious effects of climate change will deliver them to Labor, as the right retreats further into denialism, and the cognitive bubble of right wing media seals them off from the electorate and reality. But the "empirical" sensibility of aspirationals is currently most offended, we are told, by the "antisocial behaviour" of an "underclass" whom they must encounter in their suburbs, in public schools, and occasionally on television, in news items about remote aboriginal communities.Latham always espoused a moral order that favoured them over those who did not quite aspire hard enough to escape the orbit of public housing, "welfare dependency" and intergenerational disadvantage. By now, his attitude to the underprivileged has hardened into a species of contempt. He ignores the realities of structural unemployment, gaping inequality, and the inadequacy of welfare payments to openly blame the poor for their own difficulties:"Choices are available. Ultimately, however, the problem of the underclass is an inability to make good choices in life – a blindness to the possibilities of personal change. The social norms of the neighbourhood are so badly corroded that rational behaviour becomes a minority influence, the sort of thing which strange people do. What the rest of society regards as normal is seen as socially aberrant. In effect, a subculture has formed, in which residents only mix with people from the same underclass background, sharing the same ethos of irresponsibility and hopelessness. "Don Arthur has written about how empirically weak this picture of poverty is. My concern is more with values. To speak of the poor in this way is practically to divide a society into separate species. It is the opposite of egalitarianism - it sees people of different income levels who live in different neighbourhoods as essentially different in their ethos and their capabilities. And it does so in preparation for bringing the full force of the state to bear on them:"The starting point for reform must be a policy of dispersal, of moving disadvantaged people out of underclass suburbs. In public housing, where governments have the power to move tenants around, this is a straightforward task. "Remote aboriginal communities are simply assimilated to this "underclass". They too need to be broken up:"High expectations have not been matched by tangible improvements in lifestyle normality, schooling and the development of new business ventures. The reason for this is straightforward. As long as disadvantaged Aboriginal people continue to live in isolated, disadvantaged communities, they can never break the cycle of underclass culture. "The difficulties faced by the most economically disadvantaged mean, for Latham, that their communities have surrendered the right to exist. Or perhaps it's closer to the truth to say that "community" is not something he considers his underclass to fully partake in. He actively dismisses any role for indigenous leaders in remote communities, or any persistent connection between aborigines and the land they live on. No consultation is necessary, no autonomy is permissible. This is a frankly authoritarian proposal to forcibly rip communities apart because their inhabitants have not acquired the jobs that don't exist in our economy, or have been trapped in circumstances that previous government policy has engineered.It's a crazy-mirror class war, where the support of the petit-bourgeoisie is secured in order to turn the full coercive and disruptive power of the state on the obstinately poor. In this sense, and in its abjection of the "underclass", it is closely akin to Blairism - Matt Cowgill forcefully draws the connections between this and the Clause IV generation in the United Kingdom. The Blairist connection is also visible in Latham's recommendations on education - he wants to discipline school teachers by means of constant testing, muscling up to education unions, and imposing a market on public schools. At the same time as proposing to erode the autonomy and conditions of teachers, he expresses the hope of bringing high achievers into the profession.Needless to say, the most dramatic recent improvements in school systems have arisen from doing the opposite of what Latham suggests. Finland's government has made a long term investment in education, has worked with unions, and emphasises equal treatment of schools, students and teachers. Schools have not only been kept as a public resource, but they have moved closer to the centre of the meaning of the public. Teachers are paid well, and esteemed, not micromanaged. They do not carry out endless testing. Latham's proposals, on the other hand, are not evidenced by way of successful implementations of like schemes. That is because they're not empirical, but ideological, and can't think of the public sector except as inherently wasteful.Latham's program is meant to appeal to a cohort whose values he assures us he understands, but whose continued existence provides very little evidence of. He can't, because they're illusory - they're probably best thought of as the narcissistic projection, or better still as an inadvertent piece of snobbery. Latham imagines that suburban voters have no broader ambition or vision than their own immediate material advancement, when there is ample evidence available that they are most worried about the decline or disappearance of what we hold in common.Latham's fantasy can also perhaps remind us of of some broader problems in the labour movement. The ALP that talks about "the Lindsay test", second-guesses itself according to the whims of the Daily Telegraph, plonks Gillard in western Sydney and hews to roughly the same orthodoxies as the Liberals may not survive. There's no reason to vote for it. To the extent that it embraces a "post-Left" future that further alienates progressive voters, it will lose a rich source of potential candidates, activists and evangelists. As long as it withdraws from the provision of services and uses the state principally as an instrument to scapegoat and punish the poor, it will be practically indistinguishable from the conservative parties, and it will be implementing policies that voters have been opposed to for as long as they've been asked about it. If Labor is looking to represent broadly shared values, it should oppose itself to the evisceration of the commons. There is already one Liberal Party; Labor will get nowhere by aping it. Not Dead Yet: Labor’s Post-Left Future describes a party with an identity that is in conflict with itself and the changing nature of Australian society. Australia is very different to the Australia that gave birth to the Australian Labor Party in the 1890s. Australia’s working class no longer is necessarily economically disadvantaged or even supporters of the labour movement. Latham correctly identifies that civil society has changed and developed to a post political party environment; meaning that individuals opt to participate in civil society groups, even though they might be political in nature, remain outside the mainstream political process. Mark Latham laments that while union membership is at around 16%, the ALP is still controlled by an “oligarchy of union-based factional leaders” whose unquestioned power extends to who gets pre-selected, which issues get “debated” at party state/national conferences and how delegates to these conferences vote. This, he argues, has lead to disengagement by the rank and file membership who struggle to participate in a party that seems to be full of “the ageing party faithful, plus party members of parliament and their staff and hustling aspirants for elected office”. Of all Latham’s recommendations it was his focus on using education as a tool to economic and social empowerment which also included improving the status of the teaching profession, using the Asian model of education (encouraging and supporting parents in the education of the children) and improving pre-school education. Also his focus on poverty in Australia was a good reminder Australia is not a lucky country for everyone. latham's essay is a case of "matter and impertinency mix'd" (king lear: iv,6). some good ideas & some lousy ones. the characteristic latham paranoia still in evidence. he's still too partisan to survey australian politics with the necessary equanimity. though nice to see he's taken time to read a little noël coward. Some valid points about the influence and the out of whack proportion of union representation in the political party. Mark Latham - Mark William Latham, a former Australian politician, was leader of the Federal Parliamentary Australian Labor Party and Leader of the Opposition from December 2003 to January 2005.